National Public Radio’s Morning Edition recently aired a story featuring research by Shauna Hallmark, InTrans transportation engineer, director of the Midwest Transportation Consortium, and associate professor of civil and construction engineering at Iowa State University. 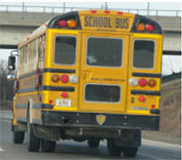 The research evaluated the performance of two hybrid-electric school buses in Iowa communities. Hallmark’s report and a technical summary of this project are online.